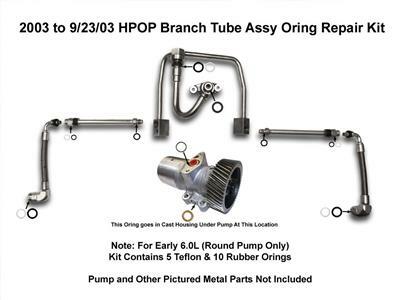 The HPOP Branch Tube Assembly O-Ring Repair Kit for your 2003 Ford 6.0L Powerstroke is designed to repair the leaking hard pipe leading to the High Pressure Oil Pump (HPOP). Oil leaks on the early model 6.0L Ford / International Powerstroke high pressure oil system can cause a very challenging diagnostic process. One common problem that is often diagnosed as a pump failure is the seal around the hard piping leading to the pump. 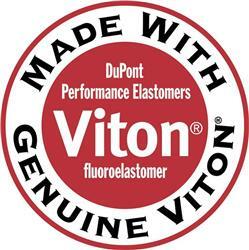 Professor Foam has the replacement Teflon and Viton O-rings available now. This is an item that is not available from the OEM; they only offer the hard piping, not the seals. This kit doesnt include the pump cover gasket. Fits models built before 9/23/03. Pump and other pictured metal parts not included. This kit contains black or brown viton O-rings - color has nothing to do with what its made of, Viton is stronger and more resistant to chemicals. Someone who is selling o rings that are brown and calling them viton is mistaken, any type of o ring can be sold in any color, so color is not a trade of Viton!